Every day should begin with hot air balloons cresting the ridge next to my house. They should then progress into strawberry cake walks for noble causes, transition into birthday parties for one year olds (lucky enough to have such talented and crafty mommas), and culminate with impromptu thai food dinner parties lovingly cooked by splendid husbands (like my G.) for eight friends and their collective 4 children. That's how my Saturday went and it was magnificent. Yup. It's decided. Every day should proceed accordingly. Hi everyone! My "Small Measures with Ashley" post is up on Design Sponge. This week's topic discusses "green" or environmentally friendly toys for children. You can read the entire bit here. With Nugget on the way, I've begun thinking about toys. Well, toys, cloth diapers, onesies, car seats, bassinets, and co-sleepers, not to mention a changing table, how the cats will handle the crying, whether or not the dogs will trample Nugget, what we'll name him, if we'll ever sleep again, and so. much. more. I am TOTALLY open to any and all suggestions for green-minded items for tots. If you're got 'em, bring 'em. I'm all ears. Happy Memorial Day! I'm sending big love and snuggly hugs to my younger brother who's out at sea for 9 long months with the Navy! I like to think of him as being simply "On A Boat." Love you, Walkie! I mentioned last weekend that I'd be heading out to the 3rd class in the 4-part series on organic gardening I'm taking at Red Wing Farm. What a delight it is to visit Beth and Christopher's place. I always feel like I've been transported to the south of France, where most meals are taken outdoors, trees sway languidly in gentle breezes, everything grows in such lush abundance that it's almost scandalous, and wildlife abounds. Idyllic hardly even begins to capture the essence of the place. It's transportive. Otherworldly. Bucolic beyond belief. In short, I love it and I adore Beth and Christopher and will gladly find any and every excuse to traipse through their gardens, gaze at their yurt/dome (known as a "yome"), sit aside their former-horse-barn-converted-into-a-home, and learn how it is that they've cultivated their sage and seasoned gardening prowess. I'd encourage you to do the same, should you find yourself in this corner of the world. *To see more from our visit to Red Wing, take a peek here. **Sorry for the brief interlude in posts. We got some potentially scary news from test results on "nugget" last week. I've been mentally pre-occupied like you wouldn't believe. A trip to Charlotte this past Tuesday for a round of additional tests confirmed yesterday that nugget is healthy and growing up splendidly. It also informed us that our squirmer is a boy! Bring the ruckus, little man! We're ready to rumble! Happy Friday, everyone! My "Small Measures with Ashley" post is up on Design Sponge. Today's topic discusses the ecological impact made possible through the seemingly radical concept (nowadays) of eating in. May your weekend be magical. I'll be heading out shortly to bake cakes at work. We're in the thick of wedding season with a heap of towering deliciousness to work through. Tomorrow I'll hop over to my friend's farm for the third installment in their organic gardening class. Sunday it's back to work, although, enjoying the aromas of cupcakes and layer cakes whilst chatting with friends old and new and pouring hot coffee hardly seems befitting of the term "work." Five furry friends keeping me company on a dark and rainy Friday morning. The wet dogs are, thankfully, drying off upstairs. Not a bad start. Our home has no air conditioning. Living in the mountains as we do, this generally poses no problem. That said, on especially humid days, or days that incur a good deal of physical labor, or even just days when this preggers lady needs something cold and refreshing and zesty and needs it stat, nothing beats Hubs's Ginger Lemonade. Zippy and zingy and puckery and sweet and perfect in all the right ways, this lemonade puts the kibosh on whatever ails you. From our home to yours, I seriously encourage you to incorporate it into your hot weather beverage repertoire, a.c. or no a.c.
-To 4 c. cold water, add the sugar and ginger. -Microwave on full power for three minutes*. -Stir, and microwave for two more minutes. -Remove from microwave, and stir in the honey. -Let the hot mixture cool for a couple minutes. -Meanwhile, juice lemons and strain seeds. -Strain the hot liquid (to remove the ginger) into a large pitcher. -Add the lemon juice (including the pulp if desired). -Fill the pitcher about 2/3rds the way up with ice; stir. -Fill the rest of the way up with cold water; stir. -Serve with a little curl of lemon peel garnish, if desired. *Alternatively, you can heat a few cups of water in a teapot, stir in the sugar and honey, and steep the ginger in the mixture for a few minutes. Good morning! I've got a few newsworthy bits for you today. To begin, I learned yesterday that my "Canning & Preserving" book received an honorable mention in the "How-To" category at this year's Green Book Festival in Los Angeles. I'm so humbled. What an honor! Secondly, there's now another online resource available for purchasing my "Keeping Chickens" book. Derek over at My Pet Chicken wrote to tell me that his online store (which, in addition to carrying loads of equipment, as well as actual chickens, is also a PHENOMENAL resource for chicken-tendering chats with other like minded folks) now carries my book! You can order it here. Come back later in the week for a recipe guaranteed to whet your springtime-parched whistle! My "Small Measures with Ashley" post is up over on Design Sponge. Today's topic discusses "biodegradable disposables." With spring in full swing and summer swiftly approaching, considering in advance what you'll do with all of the potential waste generated at family gatherings, cookouts with friends, days at the beach, and other get-togethers will go far towards preventing it in the first place! What do you have planned for your weekend? Today, I'll be toiling the soil, working in the yard. I've got an interview later this afternoon with French Elle. Tomorrow, Kate from the "Hip Girl's Guide To Homemaking" will be in town for her younger brother's graduation from my alma mater and then coming out to the English compound for a chat and a sit. After that, hubs and I will be cooking up some delicious vittles (I'm thinking I'll bust these old standbys out) and heading to the Bountiful Cities annual Birdhouse auction (Slow Food Asheville will be providing the food; Asheville folks, come out and support this wildly creative and loads of fun event!). My husband and I are the ultimate collaborators. With both of us working from home as we do, we see each other a lot. It never gets old. We consult and chat and scheme on everything, from what's for dinner, to friends, relationships, Project Runway looks, and what on earth is really happening on "Lost" (does anyone know, because I don't see how it could possibly get tidied up nicely in two weeks). We discuss fashion choices and new dinner plate options and weird interactions with folks at the grocery store. We're tight, super tight. He's got my back, always, and I've got his. We're permanently propping each other up, full of unconditional loving support. And so, when we got a certain suspicion that a certain monumental event was building in our lives, we set about chatting about it. With cautious optimism, we starting reading, and researching, and consulting professionals. Today, I'd like to share with you that our suspicions are in fact completely true: we'll be adding to the English clan. "Nugget", as I've temporarily dubbed our little nudger, is due on the scene November 1st, an auspicious date as it's both my older brother's and a dear friend's birthday (although, no offense to All Saints Day, but I'd be thrilled if Nugget decided to permanently throw down on Halloween; is there any better birthday, really?). I'm 15 1/2 weeks along. A visit to our nurse midwife today confirmed, for the third time, Nugget's strong and fast heartbeat (every time they put the sonogram on my belly in a quest to locate our squirmer, all I can imagine are synchronized swimming movies, a la Busby Berkeley). Nugget is a quick and agile glider, moving around and about as fast as fast can go. I won't lie-it's been challenging so far. An indication of a strong fetus, Nugget has kept me almost constantly queasy, among other things. I've taken more naps than I've ever taken in my life. I've started eating turkey and chicken after over a decade-long hiatus. I've had heartburn and weird tastes in my mouth and a superhuman sense of smell and other things too delicate to discuss here. And I'll take more. Whatever Nugget's got, I'll take it, because hubs and I couldn't be more thrilled. We invited Nugget into our lives at the turn of the year and have been ready for it's arrival ever since. And so, if I've been sluggish in my posts, or lagging in my social obligations, or just generally AWOL, now you know why. When you're cooking up another being, you need a few passes every now and then. I'm thrilled for all that's ahead. We're planning on having Nugget here, chez English. There will be dogs and cats and autumn breezes and a blazing wood stove when Nugget bids us welcome. There will be Halloween candy and maybe costumes and pumpkins and hard cider. There will be friends and grandparents and loads and loads of love. For the author of the "Homemade Living" series, I'm ready to celebrate the birth of this project with flair, gusto, and open arms. My "Small Measures with Ashley" post is up over at Design Sponge. 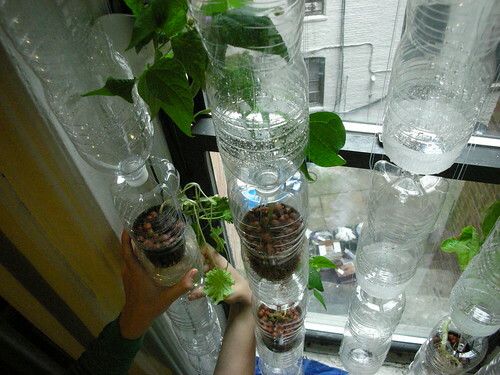 This week's topic discusses "window farms", an absolutely brilliant solution to a "growing" urban issue. Take a look here to read the full post. Whew! What madness this past week brought! What with New York and 8 chapters of copy-editing for my 4th book in the Homemade Living series, "Keeping Bees" (Spring, 2011), coupled with hosting both sisters for the weekend and a baby shower two hours away in Charlotte for my sister-in-law and brother (SO EXCITED!!! ), along with work, housework, and otherwise remembering to breathe, it's been a whirlwind. On top of that, there's this enormous project I've been studiously laboring over since February. I promise to tell you all about it tomorrow afternoon. For now, I'm jumping off to work (I'm really, really loving it there). Have a lovely Monday and see you tomorrow! Hi Everyone! My "Small Measures with Ashley" post is up over at Design Sponge. This week's topic discusses "work" or "labor" parties, a.k.a. "getting by with a little help from my friends." If you've got a chore or task too large, lengthy, or costly to tackle yourself, ask some buddies over for help. After the work is done, ply them with tasty food and bask in a job done well, not to mention done cooperatively. I know of which I speak firsthand. Yesterday afternoon, 7 close friends came over to help me spruce up my property following the rages of this past winter. In seemingly no time whatsoever, they had the place weeded, cleared, and looking properly suited up for welcoming spring guests. I cannot begin to fully convey the depths of my gratitude to them. In the future, I fully intend to return the favor, because no good deed really should go unnoticed. It was delicious and refreshing and satisfying in so many ways. This morning I awoke to the site of a well-groomed yard and an abiding sense of appreciation for having such a generous group of loving friends. May you all have a lovely week ahead. I'm off to the Big Apple Tuesday-Wednesday. I'm super excited to have lunch at this place on Tuesday with Grace from Design Sponge (my editor, and yet, we've never actually met!) and Sarah of Saipua, whose hilarity I can't wait to experience first hand. I'm hoping to take in a museum on Wednesday, as well as experience the delights found at this place. I'll be sure to post photos!